The Sliven Region is at the foot of the Sinite Kamani Mountains. It is a picturesque retreat, with fresh air and clean water, with mild winters and cool summers. It is also one of Europe’s oldest settled areas. One of Sliven’s most famous landmarks is in the Sinite Kamani massif: Halkata, which curves out of the rock like the handle of a teacup. It’s part of local tradition that it possesses magical powers. Time and nature have blessed the region with many of these natural rock sculptures, especially in the Zmeevi Dupki Cave. The region also has an impressively diverse collection of flora and fauna thriving in its mostly mountainous terrain. Sliven also offers easy access to some great mineral springs. Sliven has been inhabited since the ancient times; the pre-historic tells (particularly the Karanovo tell, which is the biggest in Europe), ruins of Roman fortifications, grand homes built during the prosperous National Revival Period, and monuments to heroes of the Ottoman period are all reminders of the region’s long history. The locals have preserved their folk traditions, and today the region draws many visitors who would like to find a more genuine Bulgarian experience. Carpet-weaving is a proud tradition in the region, especially in the town of Kotel, which was once Bulgaria’s carpet capital. Sliven’s economy continues to depend on the textiles industry as well as on machinery production, glass-blowing and chemical production. Sliven is Bulgaria’s main provider of peaches. The municipality’s Valley of the Peaches is dotted with peach orchards and peach harvesting and processing companies. Close to the town is Karandila, which includes old beech forests and the Sinite Kamani Nature Park. The park’s biggest attraction is its famous rock formation, Halkata, a protrusion arcing up and out and then back into itself, leaving a hole in the centre for visitors to look through. Sliven’s dairy and winemaking industries continue to boost the region’s economy, though there is also some heavy industry in the town. 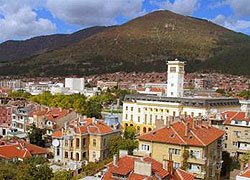 Sliven is, in fact, one of Bulgaria’s manufacturing pioneers. The first factory in the country was built here, kicking off the industrial age in Bulgaria. It is still one of the country’s industrial centres.